Now, the problem with being an utter delight, is that people want to talk to you. 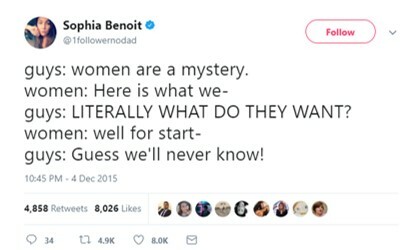 Like, all the time. In every possible situation. The pressures of being such a joy to be around are great. Like most people I commute to work. But I don’t drive in, I take the train. I much prefer the train to the car – it’s easier, cheaper and as an anthropologist it gives me considerable opportunity to people-watch. Also, the train is a microcosm of human society and you can see all manner of interaction at play. Like students in the lecture theatre, commuters tend to sit in the same seats every day (the psychogeography of the commute should be the title of my short story anthology…); college students discuss their nights out and very occasionally their coursework; there’s a group of girls who take the same four seats facing each other at the end of the carriage and talk literally nonstop; there was even a couple in a secret relationship for a while, but I’m sorry to say readers, it did not last. We even have a conductor who only talks in rhyme (not as annoying as you might think, despite the assumption that it’d make your heart sink…). But you don’t care about my train journeys. Or maybe you do. In which case you probably need more things in your life. The other thing I like about train journeys is being left alone. Work is busy. Home is busy. The commute is one of the few times where I can think in peace, or write emails, or read. Sometimes colleagues will see me and sit next to me for a chat, but they usually only do that once, after they realise that I’m really not as sociable as they had thought. A nod to acknowledge your existence is about your lot. What surprised me this year though, is how many students have come up to me to chat at the station or on the train. It’s really just a reflection of me making the effort to greet all of our students in Welcome Week and then popping into various lessons and labs to see what they’re up to and therefore breaking down that sense of them and us. And despite the fact that these commuter chats have meant that I haven’t been able to eat the Oreos stashed in my bag (because politeness would dictate that I would have to share, and I do not share food), it has meant that the School and our students are constantly in conversation. We’ve worked hard this year to ensure that our students not only have a variety of opportunities to discuss their courses and higher education experience with us, but also to recognise when that is happening. We’ve done some good work with our School Reps already, and look to develop things further with our Course Reps. I’ve even introduced some Town Hall style meetings, where students can pop along and ask anything they want direct to the Associate Dean. Coincidentally, communication and partnership crop up a fair bit in the two books I’ve just finished: Developing the Higher Education Curriculum (Carnell and Fung, 2017) and The Interactive Past (Mol et al., 2017). The first is primarily about creating a research-informed curriculum (although you have to wade through a lot of ‘UCL is the best!’ narrative to get there) with a number of the case-studies emphasising the importance of co-producing research with students, and working with students to devise a curriculum that makes sense to them – and in one of my favourite chapters, how to make a modern South African higher education connect to the students’ actual lived experiences. Generally, staff-student dialogue is at the heart of a lot of these examples. The second volume explores the use of video games in archaeology. A quick scroll through my Twitter feed will show my interest in games and my repeated attempts to shoehorn them into my teaching, so it’s no wonder I was drawn to this book. 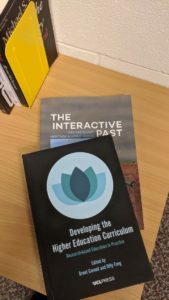 There were a couple of chapters which I felt ended with their discussions going up their own auxiliary ports, but generally it effectively demonstrated the potential of video games in supporting archaeological initiatives. Crucially, a couple of chapters describe partnerships between game producers and indigenous peoples (see one award-winning output, Never Alone, here). In all of the ventures laid out in this book, dialogue was crucial to ensuring a fuller understanding of these stories, myths and histories. This is vital not just to better support the public in their understanding of the work of archaeologists, but also in terms of cultural appropriation and ‘ownership’ of heritage. In my School, we are running with a number of mechanisms, because we want to ensure that every student has some means of communication that resonates with them. As I said above, we have our School and Course Reps, we have regular students meetings with course teams, we have the EvaSys module evaluation software, and we have Town Hall meetings. What’s interesting from my perspective, is how each of these routes produces different sorts of dialogues, with the balance of staff-led or student-led shifting back and forth.